Explore this collection of Kansas as a place, state of mind, dream and reality, and center of the heartland. In over 230 pages of poetry, this collection brings to readers the best from the collectively edited website, 150 Kansas Poems. two young Kansans on vacation, nearly to New Orleans. they drift on the winds above the white-capped sea. the fire of our lips is doused with a kiss. An Introduction: What is Time + Place? For many years, I thought I was mostly writing poems about place. As a Brooklyn-born, New Jersey-raised Kansan, I've been drawn all my life to the talismans that convey sense of place, from the Maple tree outside the Brooklyn triplex where I learned to play “Red Light, Green Light, 123,” to the vast brome field morphing into native prairie outside my window now, where I live just south of the Wakarusa River. Yet in recent years, looking at the poems I love by other writers and what I'm drawn to write, I see how much there is to say about time, which seems to me more like a vertical sense of what seems like horizontal views of place. We live in time, or as poet Stanley Kunitz writes in his poem, “The Layers," “Live in the layers,/ not on the litter.” In a sense, I think we're like trees, the heart wood our birth, and each year adding new ring of experiences, perceptions, realizations, losses, and loves. But trees are rooted in real ground, and place also holds within it the seeds and signs of time: we can sometimes find remnant of shark's teeth on the high plains, reminding us of the inland ocean that once whipped up its own wild weather in this part of the world. The stars—burning and burning out in the ultimate infinity of space—might seem to be on an even playing field, but they bring us light that both as old as 200 million years and, in the case of our sun, as young as 8 minutes old. Likewise, our ways of inhabiting the spaces and places of our days and nights are composed of insights, wounds, memories, joys, and questions from the first time we tasted dirt as a toddler to yesterday's glimpse of the blazing orange around the setting sun. This anthology, lovingly edited by Roy Beckemeyer, explores who we are from the angles of history, geography, personal and community stories, traditions and innovations, and the spirit of life from the ordinary to the extraordinary. 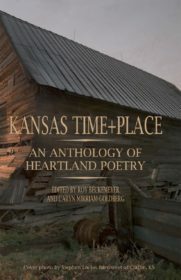 We can best find the poetic at the core of our lives through community, and so I'm deeply grateful to all the guest editors who brought poets and their poems to the three years of Kansas Time + Place: Roy J. Beckemeyer, James Benger, Dan Bentley, Annette Hope Billings, Maril Crabtree, Pat Daneman, Dennis Etzel, Jr., Jose Faus, Kat Greene, Melissa Fite Johnson, Kelly W. Johnston, William J. Karnowski, Denise Low, Lori Baker Martin, Eric McHenry, Stephen Meats, Ronda Miller, Caryn Mirriam-Goldberg, Al Ortolani, Kevin Rabas, Thomas Reynolds, Tyler Sheldon, William Sheldon, Cody Shrum, Ramona Vreeland, Diane Wahto, Laura Lee Washburn, Israel Wasserstein. Many thanks to Roy for his insightful and caring editing and book and cover design, Stephen Locke for the very time+place cover photo, and Little Balkans Press for bringing this book to life. Dear reader, I hope this book will give you a wider perspective on both your sense of place and time, and through that perspective, deeper and more enduring vision of the possibilities, even miraculous ones, for your lives and for Kansas as its own state of mind as well as a state of surprises over miles and minutes.